A Proton rocket lifted off from Kazakhstan Saturday and delivered a new communications satellite into orbit to replace two aging spacecraft serving North America. 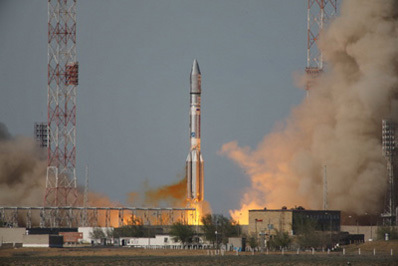 The 18-story rocket launched at 1119 GMT (7:19 a.m. EDT) from the Baikonur Cosmodrome in Kazakhstan. Within less than 10 minutes, the three-stage Proton rocket completed its duties for the flight, depositing the Breeze M upper stage and the SES 1 satellite on a suborbital trajectory. The hydrazine-fueled upper stage ignited moments later to reach a parking orbit about 120 miles high. Three more engine firings throughout the day raised the craft's altitude and reduced its orbital inclination. The rocket was targeting a near-geostationary orbit over the equator at an altitude of more than 21,000 miles, according to International Launch Services, the U.S.-based firm managing the commercial flight. The Breeze M stage deployed the 5,646-pound SES 1 payload at 2017 GMT (4:17 p.m. EDT), according to ILS. The satellite's relatively low mass allowed the Proton and Breeze M to nearly reach its final orbit. SES 1 will use its own maneuvering thrusters to reach its permananet slot in the geostationary arc at 101 degrees west longitude, where it will enter service in about a month for SES World Skies. 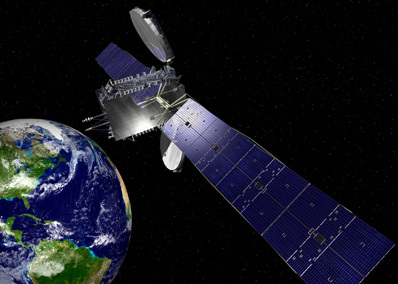 "The successful, on-time launch on ILS Proton of SES 1 marks a very significant event for our North American customers," said Rob Bednarek, president and CEO of SES World Skies. "SES 1 will provide uninterrupted replacement capacity for SES World Skies, providing TV programming into every cable network in America. This is the first of five SES missions on ILS Proton in the next 18 months. We look forward to our future launches with ILS and the same quality and schedule assurance that we have come to count on for the continued expansion and replacement of our satellite fleet." The spacecraft will replace the aging AMC 2 and AMC 4 satellites covering the United States. "The SES 1 satellite is important as a symbol to our customers of reinvestment," said Bryan McGuirk, SES World Skies vice president of North America sales. "We are replacing our AMC 4 and AMC 2 satellites at 101 degrees west and bringing 50-state capacity to our customers in enterprise, media and the government segments." Communications networks and high-definition cable television programming will be powered by SES 1 once it becomes operational. The spacecraft's communications package includes a suite of 24 C-band and 24 Ku-band transponders, plus two 7.5-foot diameter antenna reflectors. Built by Orbital Sciences Corp., the spacecraft is the first platform to bear the SES name. The new SES World Skies satellites will replace existing assets in orbit providing communications for customers around the world. According to an SES earnings statement released Friday, the company's fleet has experienced several solar array circuit failures on satellites built by Lockheed Martin Corp.
AMC and AMC 4 were both manufactured by Lockheed Martin and launched in 1997 and 1999, respectively. The launch of SES 1 "marks the start of the replacement program of the North American fleet, which will provide additional mitigation against potential future circuit failures," the company said in the statement. Two more SES satellites are scheduled for launch in 2011 to further augment the company's communications coverage of North America. "SES currently has two additional spacecraft under construction with Orbital Sciences Corp., but SES 1 marks the first launch within our comprehensive replacement program over North America," said Martin Halliwell, president of SES Engineering. The spacecraft are based on Orbital's Star 2.4 medium-class satellite bus. "This is the first of our Star 2.4 class satellites produced for SES," said Mike Larkin, executive vice president and general manager of Orbital's space systems group. "This satellite will have, among other enhancements, increased power and additional space for payload components." The Proton's next commercial ILS launch is scheduled for June with the BADR 5 communications satellite for the Middle East.